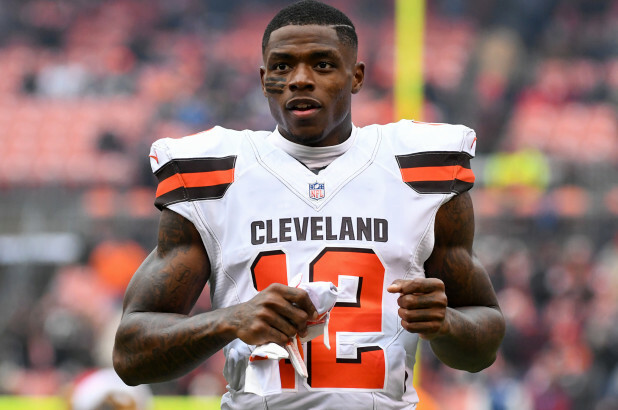 After remaining patient with Josh Gordon for so many years, so many games missed due to suspensions, and a training camp absence, the Browns traded their talented, but oft-troubled receiver to the Patriots on Monday. A recent report from The Athletic, which emerged Monday night, explains why the Browns finally decided to move on from Gordon. According to The Athletic's Zac Jackson, the Browns lost trust in Gordon after he misled them about a commercial shoot that took place at the Browns' facility on Friday night, injured his hamstring at the filming, and then showed up late to the facility on Saturday. Gordon was granted permission by the Browns to conduct a photo shoot for his "Flash" clothing line Friday evening, but instead, he was participating in the filming of what one source called a "hype video" intended to be released as a social-media commercial. At least five other people were present as Gordon went through football-related drills, and after about 90 minutes of shooting Friday, the source said Gordon pulled up limping while running a 40-yard dash and grabbed at his hamstring. According to The Athletic, Gordon was 10 minutes late to a team meeting the following morning. After the medical staff ruled him out for Sunday's game, the Browns decision makers "decided they were done trusting Gordon," Jackson wrote. We know what happened next. On Saturday night, the Browns announced they were planning to move on from Gordon. On Sunday, the Browns lost to the Saints. On Monday, the Browns traded Gordon to the Patriots in exchange for a fifth-round pick. Now, Gordon gets a fresh start with the best franchise in football while the Browns, the worst franchise in football, soldier on without their most talented playmaker. Obviously, the Patriots aren't acquiring a sure-thing in Gordon, who's played in 11 total games since his 1,646-yard, nine-touchdown 2013 season due to suspensions. The receiver-needy Patriots are taking a risk in acquiring Gordon. But the potential rewards are undeniable -- with that 2013 season serving as evidence of Gordon's potential -- if he can stay on Bill Belichick's good side and out of trouble away from the field. For what it's worth, ESPN's Adam Schefter reported that Gordon's hamstring injury isn't going to prevent him from playing in the Patriots' Week 3 game against the Lions. Furthermore, it's difficult to grasp why the Browns felt like this was the final straw, which seems rather minor in comparison to his prior off-the-field issues. It's understandable why they would be frustrated with Gordon, but players like Gordon aren't easy to find. Regardless, the Patriots just found a way to upgrade an underwhelming receiving group by acquiring a potential superstar receiver in mid-September while the Browns are moving on from yet another former high draft pick.